Home MusicEar To The Ground	Nicolay With The Hot At Nights @ Trane Studio! The Foreign Exchange is a group that I’m not shy about professing my love for. You’ve heard me time and time again express just how much love I have for these Grammy © Nominated cats. The Foreign Exchange is no doubt one of my favourite groups to grace my ears and soul in the past few years. And not to mention, a bunch of really talented and cool people. One half of FE will be dropping some science in Toronto come July 5th, 2012. It’s a show you must attend, whether your familiar with FE or you’re just looking to add some goodness to your musical repertoire. 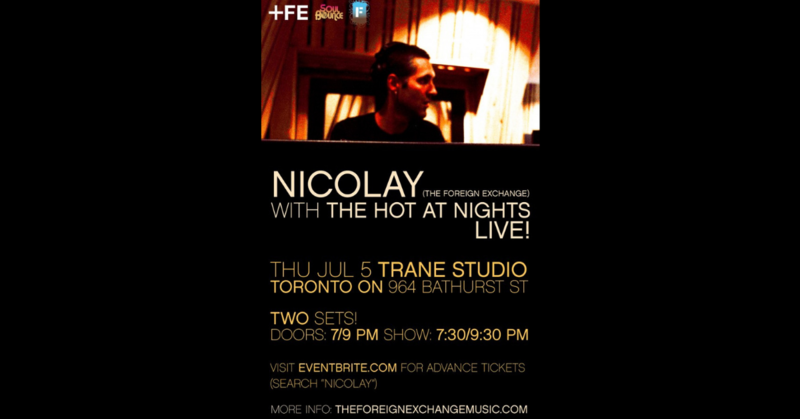 Hip hop/soul and electronica producer/performer Mr. Rook aka Nicolay, will be hitting up one of my favourite Toronto hotspots – The Trane Studio – along with North Carolina’s own jazz ensemble The Hot At Nights, to bring you their magical musical touch live and direct. But let’s go back a little bit. Nicolay has been producing tight hypnotic jazz/soul/hip hop and electronica/acid jazz (yes, all of that…) instrumental and compilation albums since 2004. The man is an all-around genius and has a remarkable ear for composing those mellow, dig deep down into your soul grooves, as well as, those hard snap-your-neck type hip hop joints. Talk about the best of both worlds. I mean, come on – City Lights Vol 1 & 1.5? Connected? If you don’t know, you better ask somebody. So will you be at Trane on July 5th? If you’re looking to win a pair of tickets, head on over to my fam at Soulbounce, as they are giving away a pair of tickets to each set. Entries will only be accepted between the hours of 6 pm on Friday, 6/22 until 12 noon on Tuesday, 7/3. Click here for more information. And on the other and, if you’re looking to get your hands on your tickets asap, you can purchase your tickets and find more information over on Eventbrite. Soulful grooves, great vibes and a fantastic venue. Can you ask for anything more?